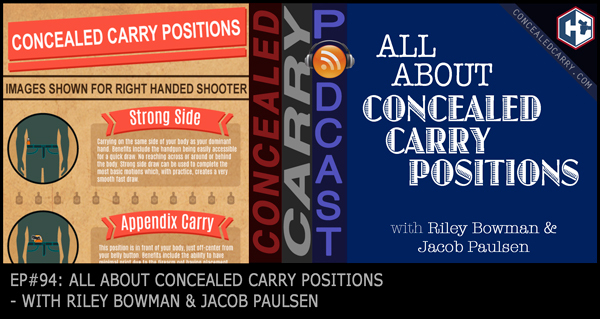 Well here you have it…all about concealed carry positions. We break down all the various positions, their pros and cons, and discuss tips and suggestions about how to make your concealed carry journey easier with fewer mistakes and wasted time and money. You can also check out the infographic mentioned in this episode HERE. Today’s episode is brought to you by Guardian Nation. Forget all the other things that we are constantly telling you about Guardian Nation. If you need one really easy, no brainer reason to join Guardian Nation it would be the quarterly box. Every 3 months, we ship each member a box of tactical gear that is worth at minimum the exact cost of 3 months of membership. So all of your membership dues are essentially returned to you each quarter in gear. Check it out at www.guardiannation.com.